I'm pretty sure I now know the meaning of 'endurance'. We're back from our lovely weekend on the slopes of Mt. Adams, near Troutdale, WA. Absolutely gorgeous views, snowcapped peaks, tall firs, lovely meadows, wonderful trails, lots of happy horses and riders. So, why the comment, you ask? Christoph and Dian just came back from a successful 5 day ride at Mt Carmel, southern Utah. The Mt. Carmel ride is part of Dave Nicholson XP series. Scenery was beautiful, the weather just about perfect. Dave, the "Duck" added two days to this years ride, for many years it has been a 3 day ride. This time we went up to over 10.000 ft on two of the days. With the heavy snow Utah experienced last winter, the riders had to negotiate over some snowy patches still left at elevation. As always, the Nicholson family did a terrific job managing this ride. Everybody was in good spirits and had a lot of fun. Deb Whorf, a long time friend and former Moab resident, flew in from Maine to attend the ride. She rode Trinity on 3 days and placed two times 3rd and one time 6th. On the last day, her horse GE Trinity, received the BC award. GE Trinity was formerly owned by Garrett Ford and resides now at the GETC facility in Moab. I wrote this for mouthy mondays on mugwump chronicles about an endurance ride my dear friend Ruth and I did years ago... I wonder if she remembers it like I did? I must have been about 14 and my favorite riding buddy at the time was 12. We found a flyer for an endurance ride at the local feed store. It was over the same trails we rode almost every weekend. We just knew we were going to be a shoo-in to win this ride. We had no idea what the ride entailed or what endurance rides were all about, we just knew that our horses knew those trails and were in excellent physical shape. We were giddy and excited about our big find and made a pact not to tell the rest of our little group so we wouldn’t have so much competition. The ride started way out on the outskirts of town instead of at the trail head. It only added a few miles onto the ride itself but since we didn’t have a horse trailer it would add a good 5 miles to our ride. But we figured that if we just rode more and more on the days leading up to the ride and really kept our horses in tip top shape we could do it. So we planned, rode and did everything a couple of teenage girls could dream up to get in shape for the big event. We made sure our horses were shod two weeks prior, we each bought some light weight saddle bags to carry our food and drinks in and of course we talked about what to wear. 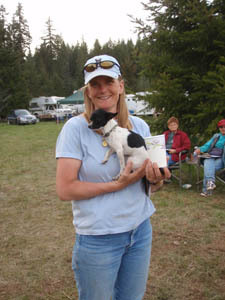 Getting away to go to the Prineville Endurance ride was my Mother's Day present to me. I hadn't been to the ride in years and there were so many people that I wanted to visit with. What fun to catch up, it was like a reunion! This was the first time Thunder and I had ventured off to Oregon for a ride. And it was to be his first 75 miler. My plan was the usual, start late, keep him by himself and out of trouble. Which wasn't too hard since most everyone took off fast and then I got on and we headed out of camp. He was a bit wound up but I thought the climb up Grey Butte would settle him down. Wrong! I was keeping him in a trot, but he was a boing machine with a pogo stick trot. On the narrow trails he was pretty good but whenever he got out in the open he was pretty spooky. Only came close to dumping me once and I hooked a heel in his side and hung on. :-) Whew! I really like those trails the Ridge Riders have built over the years! And the views of the Cascades are phenomenal! My biggest concern was that he was so intent on wanting to catch horses ahead that he didn't want to stop and drink. I'd get him to stand at the water but he'd just stare on up the trail - watching. He breezed up Kings Gap and on into the vet check at Cyrus Horse Camp. He still didn't drink and he was pushing me everywhere. Despite his antics his pulse dropped well and he vetted with A's and we went back out the trail. A couple 50 milers caught up to us and now he really wanted to go. I got off and led him for about a mile and he calmed down. I got back on and he hit a nice trot. It is just easier to settle him down that way than fight with him.